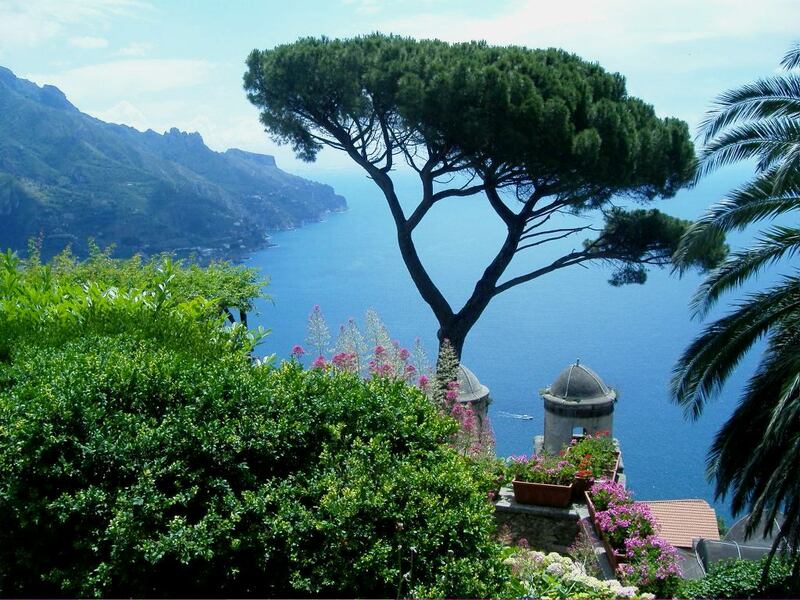 On my first visit to the Amalfi coast visiting Ravello was very special for me so we chose to spend many hours in this tiny, cliff top town dominating the Amalfi Coast and the sea. While we were there we first walked to the Villa Cimbrone which is about a 10-15 minute walk up a nice paved path along the residential hill. It is a charming path walking past vegetable gardens. 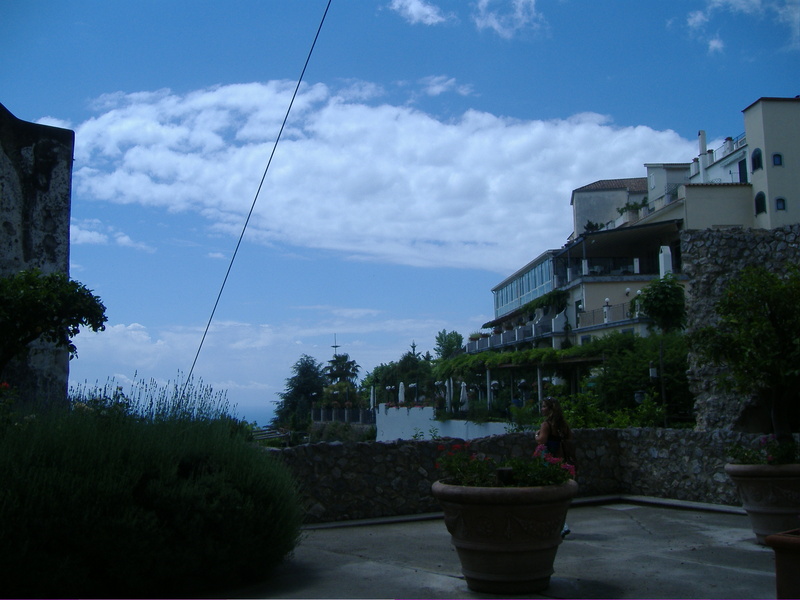 These Villa gardens are on an unbelievable site that hangs on the cliff side with a view from the peaks to the valley. There are six hectares of historic parkland which are considered to be among the most important examples of landscape and botany in the Mediterranean. At the end of the gardens is the piece de resistance – the Infinity Terrace, at the very edge of the property, with its magnificent views of the Amalfi Coast. The Terrace of Infinity with its many eighteenth century marble busts is the true star. Words and pictures cannot do it justice. These gardens are very impressive with great views, plants, trees and wonderful statues. The statues are placed in perfect settings; they are on the lawns, among the plants or given pride of place on the terrace. The gardens are beautiful and the views are absolutely magnificent. We walked around the gardens which were back dropped by a tower and parts of a castle. You walk through the ruins and into a medieval courtyard. It is a beautiful serene place to spend a leisurely afternoon. At the entrance to the gardens you receive a map which shows you the recommended walk itinerary. You can do it in half an hour or spend several hours. Each step, each corner reveals another gem of gardening ingenuity. There are plenty of garden benches along the central path on which to relax. 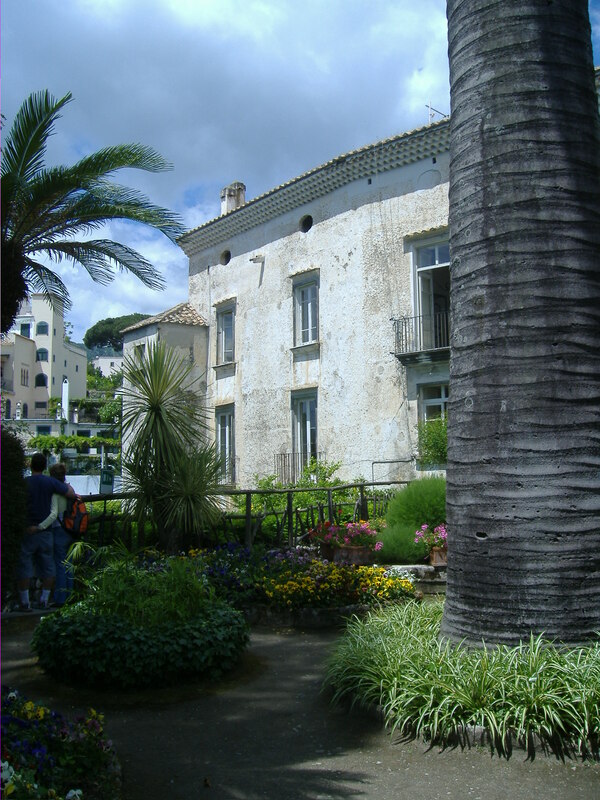 The landscape and botany of the six hectares of park is one of the most important found in this Mediterranean area. It is an experience that I will always remember. All along the Amalfi coast the views are spectacular. However, the astonishing views from Ravello, of the Mediterranean and the south coast all the way to Sicily, took my breath away. 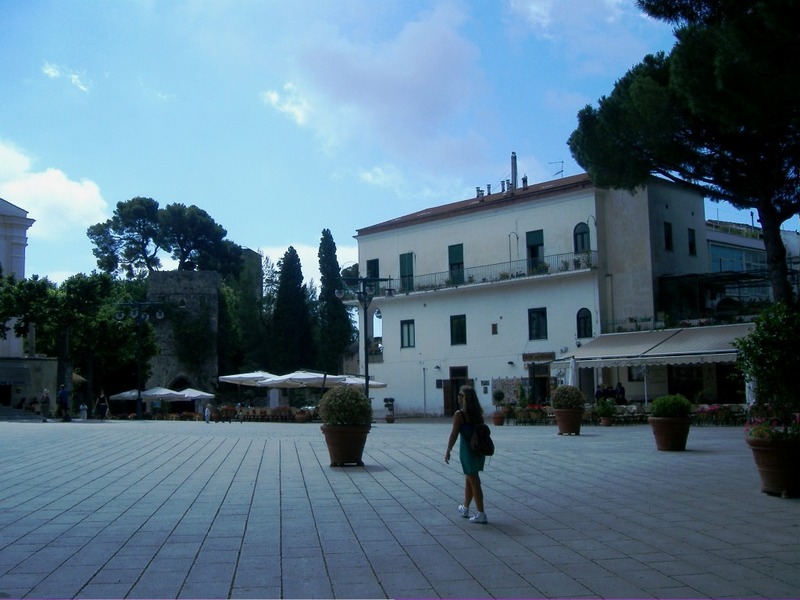 The stroll to the Villa from the centre of the city is a delight, though it is worth noting that it takes about twenty minutes and there are quite a few steps and inclines involved for anyone with walking challenges. The Villa itself is beautiful–stop by and check out the cloister in front. In addition to the main path through the garden, there are numerous meandering trails to wander, many overlooking the water. 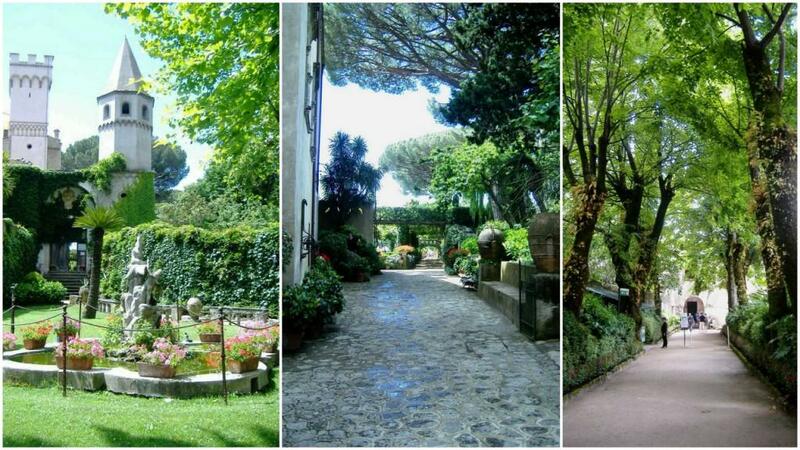 These superb gardens have the best views in the whole area, they are well looked after and the gentle walk from Ravello centre through the little narrow streets is a good way to spend a couple of hours on a fine day. 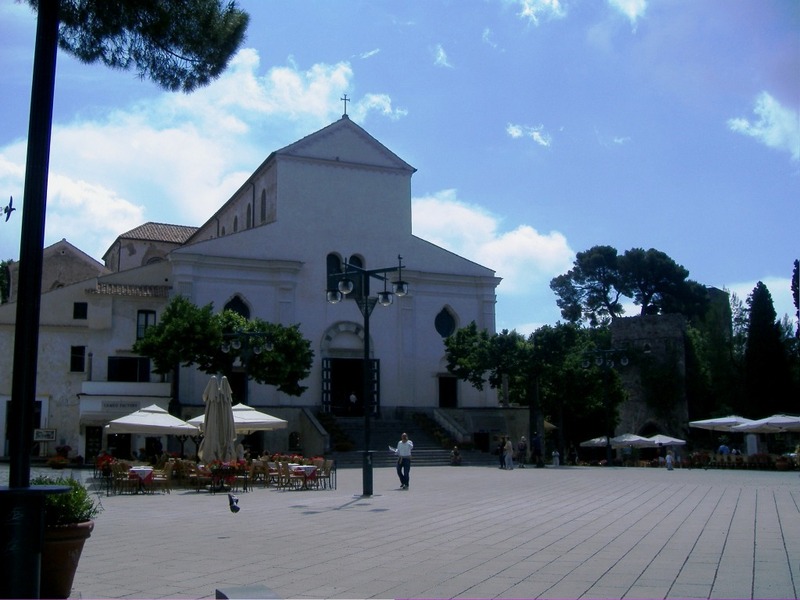 I have returned several times to Ravello since that first amazing visit, and, next time I visit the Amalfi Coast I will surely be spending time again in this glorious part of the world. Nice post, Lyn. 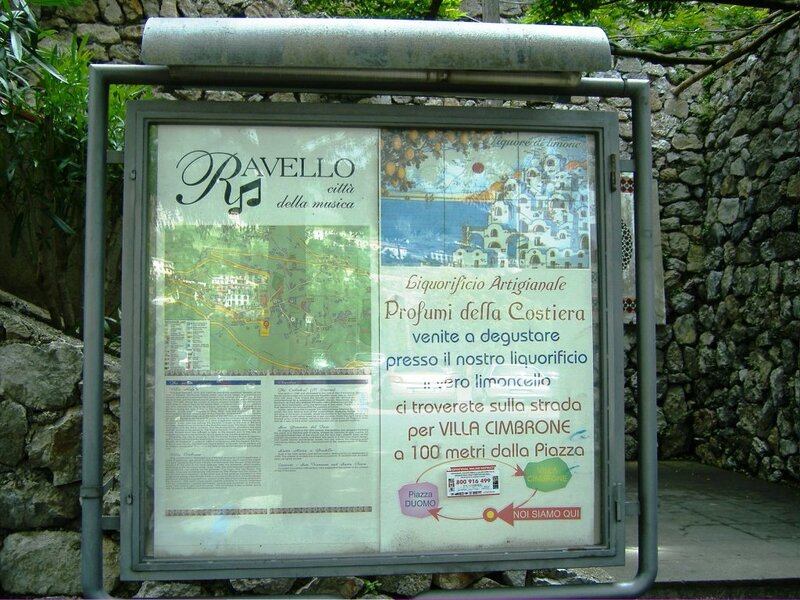 Don’t think I have been to Ravello so it’s on my wish list. I don’t think I have ever seen a coast as beautiful as the Amalfi coastline! Will the list of places I have yet to visit ever end?? It’s just got longer after reading this! 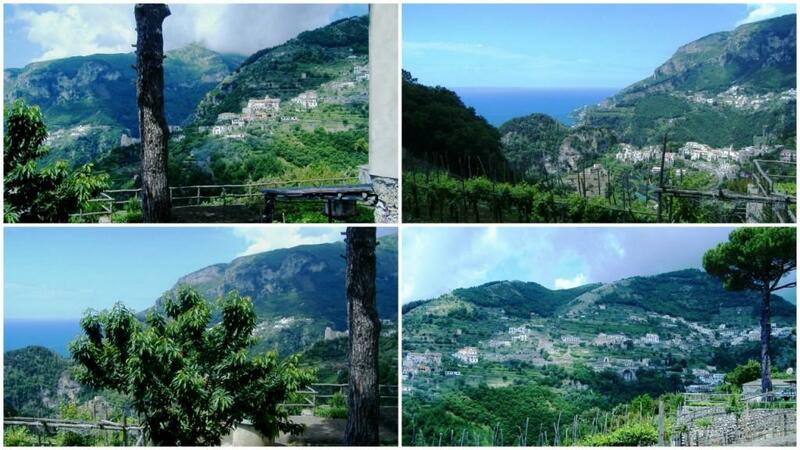 Ravello is easy to remember and hard to forget. 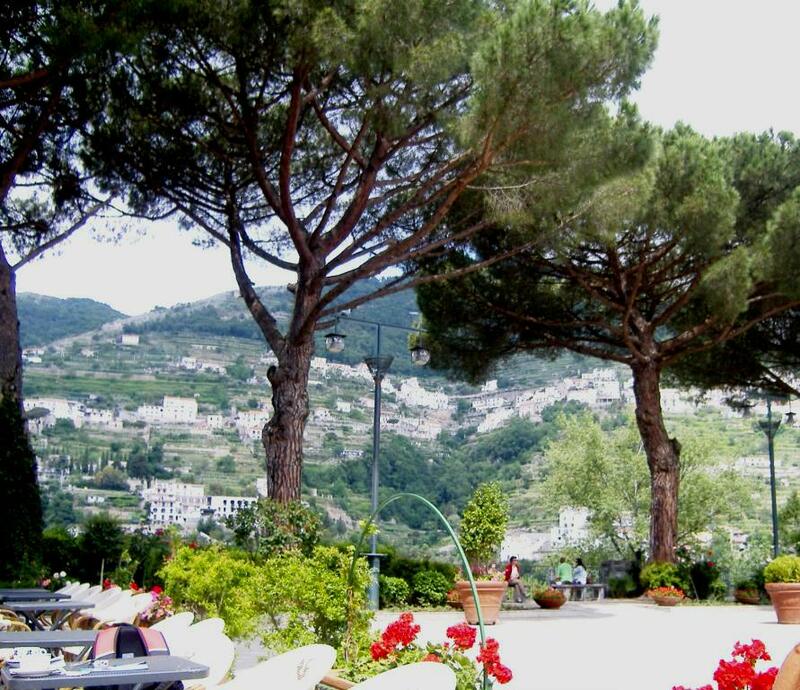 Ravello looks stunning! I’m so glad I booked a night there for my trip to the Amalfi Coast this July. I can’t wait to go there! It looks so dreamy.